The tie between currency market and interest rate remains a key force in determining the currency trends and values. Thousand of financial market participants keep eyes on the performance of an economy and the steps taken by the central banks to boost an economy. These are some of the commonly applied economic indicators to predict the change in interest rates, change in interest rate expectation, probability of introducing quantitative easing or other monetary easing and recession or boom. Yeild Curve analysis is another well proofed technique of predicting the changes in interest rates in an economy. It also helps to determine whether an economy is in recession or boom. Most of the developed economies have well established bond market and hence the yield curves. 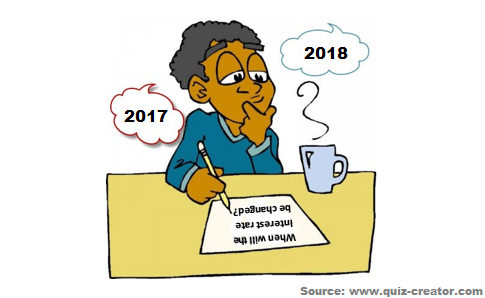 In this post we will learn the way to predict the changes in interest rates and monetary policy decisions by yield curve analysis . Yield Curve can be of any type of bonds, but here we are only focusing on the yield carve of government bonds. 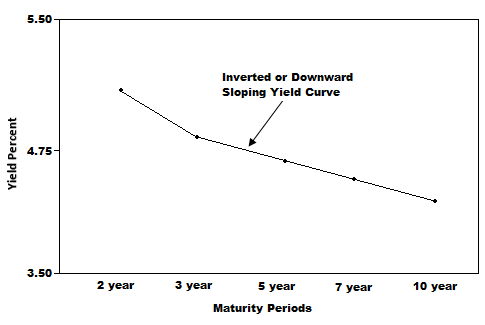 According to the investopedia.com, yield curve defined as a "A line that plots the interest rates, at a set point in time, of bonds having equal credit quality, but differing maturity dates. "In my own words, a yield curve is a line that plots the interest rates of bonds of equal credit quality, but different maturity periods. Yields curves can be of different types upward sloping, flat and inverted or downward sloping. The types of the yield curve explains the health of an economy, interest rate expectation and probability of changes in interest rates. An upward sloping yield curve is found when the economy is in good health at least not in serious recession. An upward yield curve is found when the interest rates of long term bonds are higher than the interest rates of short term bonds. It explains that the long term interest rate expectation in the economy is higher. When the yield curve is upward sloping, the economy is less likely to decrease the interest rate or introduce any quantitative easing . 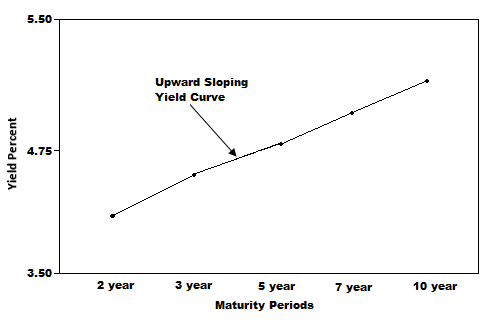 Above illustration shows an upward sloping yield curve. A flat yield curve is found when the economy is at the middle between the recession and boom. If the economy recovers from the condition, the yield curve will be turned upward sloping again, but if the economy fails to recover from the worse situation the yield curve will turn into inverted or downward sloping. 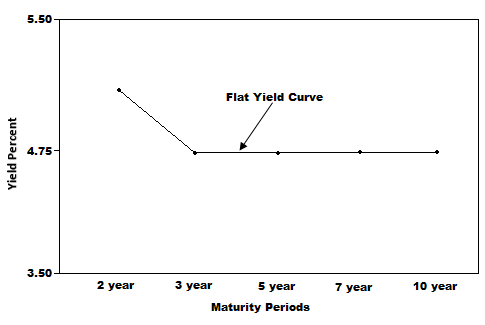 Following illustration shows a flat yield curve. A downward sloping yield curve is found when the interest rates of short term bonds are greater than the interest rates of long term bonds. A downward slopping yield curve is an omen of a coming recession. It also warns a decrease in interest rates or probability of quantitative easing.It explains that the long term interest rates expectation in the economy is decreased. Dear Traders, Almost all economies have yield curves, and yield curve analysis can be an effective tool to predict the change in interest rates, change in interest rate expectation, probability of introducing quantitative easing or other monetary easing and recession or boom. I hope this post will enrich your knowledge in fundamental analysis . If you have any question regarding this post, you can drop it into the comment section below.